A toddler boys reindeer sweater is a cheerful piece of seasonal attire that will help kids get into the holiday spirit even more. While it may be difficult for parents to convince older boys to wear a top decorated with reindeer, toddlers are generally more open to such prints and patterns, especially around the holiday season when there's much talk of Santa Claus, presents and toys. 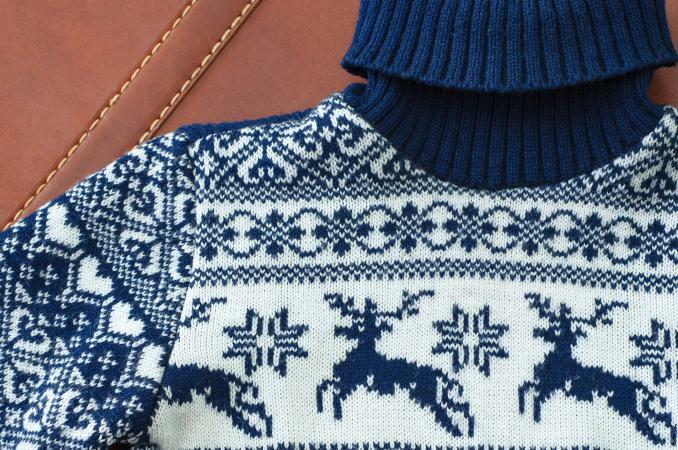 Pullovers aren't the only types of boys' sweaters you'll find adorned with cute reindeer come the holidays. You'll also find sweater vests, which can be worn over turtlenecks, crewneck long-sleeved shirts and button-down shirts. If you love pullovers for keeping your little toddler warm, there's no shortage of cute reindeer faces smiling out of sweaters in all colors. When it comes to toddler clothes, cute sells. You'll find cheery reindeer wearing cozy scarves and big smiles or prancing reindeer set against holiday backgrounds. Sweaters for boys come in blue, gray, black, green, red and more. Expect to find wool, but sweaters are also widely available in acrylic and cotton. Wool is more practical and useful for snowy climates, while other fabrics should get a toddler through mild winters just fine. Once sweaters hit store shelves, check your local retailers for a selection of toddler boys reindeer sweaters you and your toddler will love. Look in the toddler boys clothing section and you'll probably find a variety of sweaters, jackets and coats to take him through the fall and winter seasons in warmth and style. Slip a warm sweater over a tee shirt or other shirt for added warmth. Sweaters work well with a variety of pants for boys, including jeans, corduroys and khakis. Add a pair of sneakers, boots or dress shoes and your toddler will be all set for the holiday, whether you spend it at home or traveling to visit family and friends. Because toddler sweaters come in such basic and vibrant colors, they tend to accessorize well with virtually any color pants. Undoubtedly, December will see the most wear out of reindeer sweaters for people of all ages. Not only can a child take part in the seasonal cheer, he'll love wearing such a fun reminder of this very special time of year. Of course, parents can join in with their own reindeer sweaters. Although some people may find holiday-themed garments a little cheesy, why not wear these entertaining clothes while you can? The holidays are the perfect time to loosen up and outfit the entire family in patterned tops that will bring smiles to everyone's faces. Dress your toddler, then dress yourself in holiday fun.